On August 21 all of the United States will be able to witness a Total Solar Eclipse. The eclipse will cross 14 states along the 70 miles spanning the country. Many sets of solar eclipse glasses have been distributed for the occasion. However, NASA warns that most of them are unsafe, and urges people to check the specifications required to prevent accidents. The exposure of naked eyes to the sun rays can cause permanent damage and loss of sight. Only in the totality phase of the eclipse, it is safe to stare directly at the sun. The Great American Solar Eclipse is the name given to the astronomical event that is taking place on August 21st, 2017 and begins at 9:06 a.m. in Madras, Oregon. The event earned its name for being the first Total Solar Eclipse in nearly 100 years that crosses the U.S. from the West Coast of Oregon to the east of South Carolina. A total solar eclipse occurs when the Sun, the Earth, and the Moon line up. The trajectory in which this happens is called “totality path’. The totality path of this year’s event will make a straight line that passes through Oregon, Idaho, Wyoming, Montana, Nebraska, Iowa, Kansas, Missouri, Illinois, Kentucky, Tennessee, Georgia, and North and South Carolina in that order. In the rest of the country, people will be able to watch what is called a Partial Eclipse, which means the moon will not fully cover the sun. For those who are in the totality path, the eclipse will last around 2 minutes and 40 seconds. 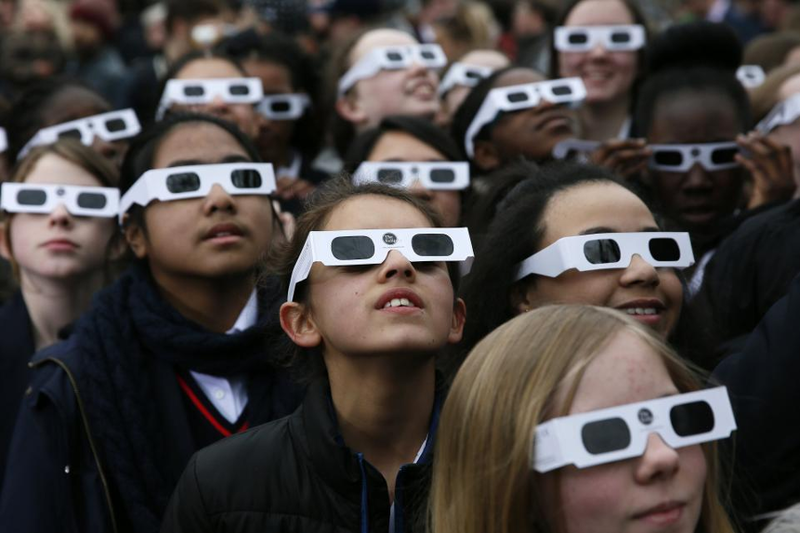 NASA encourages people to follow precise instructions to follow safety procedures and alternatives to experience the eclipse without compromising one’s health. The also insist on the fact that whichever method one decides to use you must never stare directly at the sun for long periods of time. There is only one way to look at the sun directly and its through special-purpose solar filters (eclipse glasses). The experts discourage people to use UV Protection regular glasses or homemade filters. NASA advises people to check all the manufacturer’s information and that the company meets the ISO 12312-2 international standard. To this day there are only five approved brands that meet the required standard: TSE 17, Thousand Oaks Optical, American Paper Optics, Baader Planetarium (AstroSolar Silver/Gold film only) and Rainbow Symphony. These lenses cover 100% of harmful ultra-violet rays, 100% of infrared, 99.999% of intense visible light and cost less than 20 USD. NASA advises to check for scratches or wrinkles and avoid using glasses that are older than three years. Additionally, they recommend never to look at the sun using telescopes, binoculars, unfiltered cameras or other optical devices. There are several alternative ways to enjoy the eclipse. Some may use welding hoods with a #14 or darker filter. Experts advise avoiding filters that allow seeing the landscape. 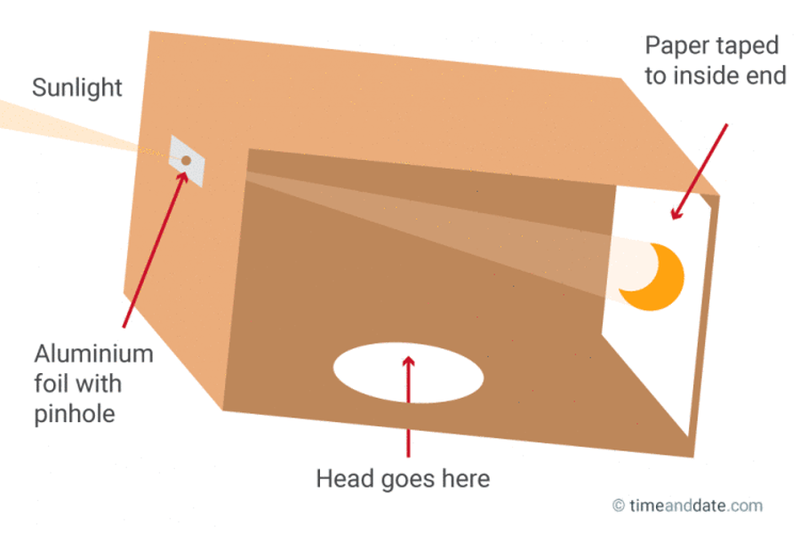 Another safe method is the “pinhole projection,” making a little hole with a piece of paper or with your fingers can make a projection of the sun on a screen, for example, a piece of paper. Using a box, make a cut and attach an aluminum sheet to it, make a little hole in it, this hole will be facing upward. Afterward, put a piece of white paper where the light will project the image of the sun. This piece of paper can work as a screen. It is important to understand that you cannot stare at the sun directly on this method, but only through the screen. A very effective way to view eclipses or planets in transit is with a telescope. However, if it doesn’t have the proper filter, you can use binoculars to make a projector similar to the pinhole method. Instead of using a little hole you can attach a pair of 7x magnification binocular to a cardboard shield (making holes in it) and seal any leaks of light with duck tape. This image will project the picture more clearly than with the pinhole method. Nevertheless, be careful not to touch or put any flammable objects near the eyepiece, the concentrated light can overheat the binoculars.